2017 marks the inaugural Beaver Creek Hike to the Mic – a one-of-a-kind music destination, perched high atop Beaver Creek's Centennial Express Chairlift, complete with a sweeping panorama of the surrounding mountain ranges. Hike to the Mic is truly about the journey, as well as the destination. For Saturday’s concert, explore the mountain as you make your way by 4x4 tour, bike, foot, or Centennial Express Gondola up to the mountaintop concert on the Spruce Saddle lawn. Along the way, discover uniquely created art pieces and photo opportunities, along with glorious views of the mountain’s fall colors. Once at the venue, be rewarded with a spacious lawn to rejuvenate, grab food and drinks, and enjoy live music at 10,000 feet. The afternoon's lineup features Grammy Award winner, Elvis Costello & the Imposters with opening quintet Elephant Revival. Upon return to the Village, you will be greeted with a Village-wide celebration of more music, art, and food – the ultimate after party. All weekend long, Hike to the Mic creates new experiences and showcases the stunning beauty of fall in the Rocky Mountains. The journey continues all weekend long with evening art exhibitions, restaurant specials, live music, free outdoor yoga, shopping and more! Come for the music, stay for the journey – Hike to the Mic 2017. I was thinking of driving from Denver to see the Kansas City show, but this is practically in my backyard. The top of Centennial lift sounds like an awesome place to see a show (and, I assume, an afternoon one at that, given the 10,000 feet plus elevation). I wouldn't bank on Costello's vocals at 10,000 feet. Dr. Luther wrote: I wouldn't bank on Costello's vocals at 10,000 feet. I understand the point. What is the highest venue Elvis has played previously, and how did he perform on that occasion? Backing singer Kitten Kuroi has posted details of her upcoming tour dates with Elvis and (separately!) Englebert Humperdinck. The schedule indicates , obviously, when she wouldn't be available for further Imperial Bedroom shows. There is , however, a gap in October,before a show with Englebert in London in November, which bodes well for 'Bedroom shows in Europe. Kitten includes the show with Elvis in Beaver Creek in September in her listing , indicating it will be more than a 'Greatest Hits' show. As John would say, "who's going" ? Preview article by Chryss Cada in the Travel section of the Denver Post. It’s always farther to the top than you think. Standing at the bottom of a ski hill during the summer, grass and wildflowers brushing your ankles, the summit seems just a couple of switchbacks away. And if you’re a skier, used to getting a lift to the top in mere minutes, your perspective is further skewed. During the middle months of the year, the elevation of a ski hill is working against you. But the effort will be richly rewarded. Warm weather reveals a whole other world waiting under the snow. It’s a miniature world just the right size for my daughters’ 6-inch dolls; a world where tiny rivulets of water become rushing streams, patches of moss are ideal for tiny picnics and alpine harebell hang from their stems like lavender lanterns. But not all things on the summer slopes are in miniature. Under the gondola on Aspen Mountain there is a scree field so steep and slippery I wasn’t the only one carrying my mountain bike down it — and in the winter you don’t even know it’s there. Summer at Mary Jane reveals that some of those giant moguls are actually massive boulders with a thick layer of snow frosting on top. And at Crested Butte, hikers negotiate tiny trails through a sloping sea of shoulder-high fireweed in July. 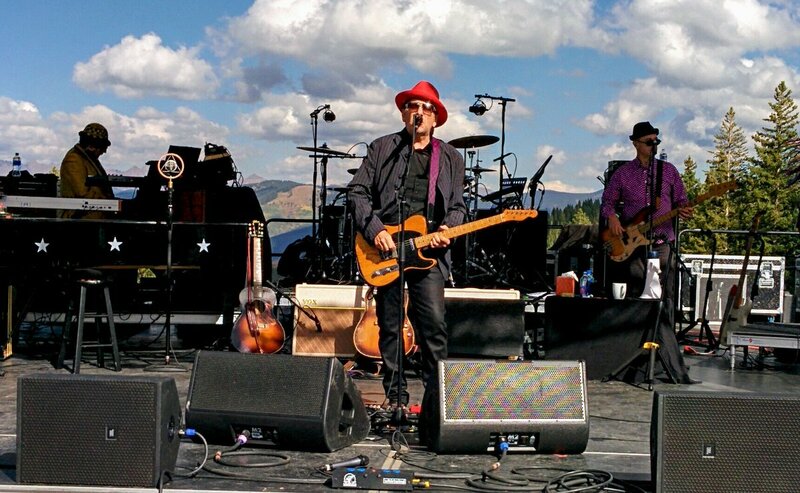 Those who make the 4-mile hike up Beaver Creek’s main mountain on Sept. 16 (and buy tickets) will find legendary musician Elvis Costello performing live outside of the Spruce Saddle Lodge. The resort’s inaugural year of Hike to the Mic will include other concerts and activities throughout the village during the weekend. The hike to the venue gains 2,000 feet in elevation and takes about two hours, including those much-needed photo breaks. Concertgoers can also take a Jeep tour up the mountain, ride a mountain bike, ride a horse or simply jump in the Centennial Gondola. For those familiar with Beaver Creek, the stage will be set on the east side of Spruce Saddle before you head down into the Rose Bowl. Seated stadium-style around the stage, spectators will have a view of the Gore Range. Bonnie Paine of Elephant Revival, the Nederland-based folk quintet opening for Costello, is looking forward to playing in the new venue. Paine cites her first concert, seeing Pink Floyd in Dallas when she was 10, as the inspiration for becoming a professional musician. “I remember feeling like every time the drummer pulsed the bass drum, I could feel my heart with all of the thousands of people in the stadium’s heart beats synching up with it,” she said. I’m hoping there will be magic up at Spruce Saddle for my daughters’ first big concert — whether the musicians find it on stage or in the beauty of nature surrounding it. Hike to the Mic with Elvis Costello and the Impostors, and Elephant Revival. Sept. 16, Beaver Creek. Tickets start at $65 plus $4.57 fee. " as i was unfamiliar with Imposters opening act this day, i wikied them. EC next collaborators???? Steve doesn't work exclusively with Elvis though so don't work too feverishly! Getting "pumped" for this Saturday's concert. It's expected to be a beautiful day in Beaver Creek. Looking forward to hiking the mountain and seeing some great music. By the way, the website confirms that this is an "Imperial Bedroom" show. Although I saw this show in its' early stages in Boston last October, I'm still anticipating a few differences and surprises!! REALLY LOOKING FORWARD TO THIS UNIQUE EVENT!! When the folks at Beaver Creek realized they hadn't had a new fall festival in a decade, they got to work. The inaugural Hike to the Mic is a three-day event featuring performances by Grammy Award-winning punk and rock band Elvis Costello and the Imposters, Nederland folk and Americana group Elephant Revival and funk band The Main Squeeze from Chicago. "It's a beautiful time of year around here," said Stacie Mesuda, a spokeswoman for Beaver Creek Resort. "The aspens are turning that deep golden yellow. How much more Colorado can you get?" Most of the concerts are on Beaver Creek Mountain, so folks have four options to get to the top: hike, bike, take a 4x4 jeep tour or ride the Centennial Express Gondola. Hikers can bust a move up the 4-mile, moderate Overlook Trail and expect it to take up to 2½ hours. Beaver Creek's signature trail is considered moderate, with an elevation gain of 1,200 feet, and travels through a large aspen grove that should be vibrant by the time of the festival. "You're earning your tunes up there," said Mesuda. Bikers can pedal up the 4-mile mountain road Cinch Trail. For those who prefer a more relaxed trip, jeep tours are available, as well as an eight-minute gondola ride, included in the ticket price. The party doesn't stop after the music on the mountain ends. Plenty of activities in Beaver Creek Village will continue on into the evenings, including more music, art, free fitness classes, chainsaw-carving demonstrations, guided hikes and food. 22. (What's So Funny 'Bout) Peace, Love And Understanding? Not much from Imperial Bedroom! As i predicted from first announcement, NOT an IB show. 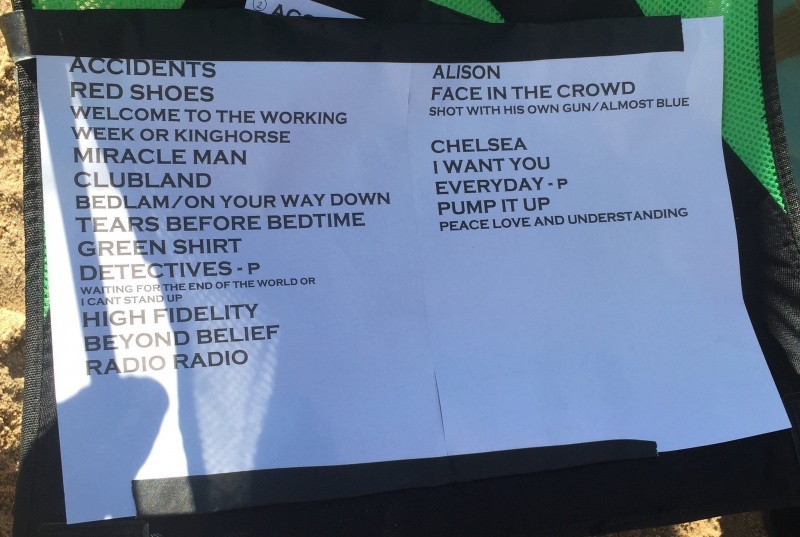 Nice setlist. Must have been a fun show... Outdoors and all. Damn. Wish I could have gone to this one. Where is the hike to mic in the Sierras? Amazing setting and beautiful day. I did get an Imperial Bedroom and Other Chambers baseball jersey . MOJO wrote: Nice setlist. Must have been a fun show... Outdoors and all. Damn. Wish I could have gone to this one. Where is the hike to mic in the Sierras? Beaver Creek is located in the central Rocky Mountains of Colorado, just 120 miles west of Denver and just 20 miles east of Eagle off of Interstate 70. It really just about 10-15 minutes from Vail. Yep. I know where it is. Would like to see a "hike to mic" fest in California with EC/Imps on bill. I'm not into flying to see a show unless someone else is picking up the bill and it doesn't impact my work week schedule. Plus, flying really bites these days. "Review" by Ross Leonhart published on 21 September 2017 in the Vail Daily. BEAVER CREEK — I've heard music has the ability to transport you places. For me, I was already there when the sounds of Elephant Revival filled the open air with the Beaver Creek ski slopes surrounding the stage at 10,000 feet. For the rest of the crowd, the first-ever Hike to the Mic concert on Saturday, Sept. 16, took them back to the 1970s and '80s, with the hits of Elvis Costello rocking the crowd. Wherever the music took us, a solid crowd of about 2,000 danced, sang and celebrated in a location we ski and snowboard past every season. The mountains behind the stage donned a fresh dusting of snow as Elephant Revival's Colorado bluegrass, taking me back to the popular WinterWonderGrass festival, previously held outdoors during the winter in Avon. It was a four-hour concert under mostly sunny skies and one of the first chilly days of fall. Elephant Revival impressed a crowd geared more toward Costello's performance in one of Bridget Law's final shows with the band. Law, who rocks the fiddle, returns to Beaver Creek on Nov. 3 to perform with her husband Tierro at the Vilar Performing Arts Center. Instead of burning their lighters, the crowd pulled out their phones when Costello took the stage, rocking his red fedora. Someone in the crowd was holding up an album cover. Down below in the village, the weekend-long event featured more live music, a master chainsaw demonstration by Don Mesuda and more. Colorado has some amazing hikes with picturesque destinations, but Hike to the Mic ranks up there with one of the best hikes to do in the Rocky Mountains. Who performs at 10,000 feet next year?"